This article by Beverley Pickard-Jones, PhD Researcher, at the School of Psychology is republished from The Conversation under a Creative Commons license. Read the original article. As the old saying goes, beauty is in the eye of the beholder. But while we can appreciate that others might hold different opinions of objects we see, not many people know that factors beyond our control can influence how we perceive the basic attributes of these objects. We might argue that something is beautiful or ugly, for example, but we would be surprised to learn that the same object is perceived as a sphere by one person but as a cube by another. The process of visual perception is a best guess scenario. When we look at something, the brain uses visual cues –sensory signals that convey information – to help work out what that thing is. This means that our perception of the world is not a simple reflection of sensory information, it is an interpretation of it. Along with colour and motion, the perception of depth is very important to help us visually perceive things. Depth helps us to understand the shape of objects and their location relative to ourselves. We need to understand it to move around our environment and interact with objects. Imagine trying to pick something up if you don’t know what shape it is, or crossing the road if you can’t accurately perceive the distance of the cars. The circle on the left is usually perceived as convex, while the circle on the right is usually perceived to be concave.To perceive depth, humans and animals rely on a number of brain processes and visual cues. One of these cues is shading information: we can perceive depth by simply interpreting the patterns of light and dark on the surface of objects, without needing to refer to any other information. In order to perceive depth from shading patterns, we must either know or assume the position of the light source that illuminates the object. By default, if the light source is not apparent, we assume that the light comes from above the object. Look at the fist image (above right). The sphere on the left will most likely appear convex (protruding outwards). This is because it is lighter at the top, which reflects the patterns of light and dark that would be produced on a convex object if there was an overhead light source. 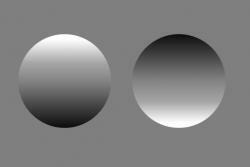 The sphere on the right usually looks concave (recessed inwards) because it’s darker at the top. Again, if there was an overhead light source, a concave object would be darker at the top because the upward-facing portions of the object catch the light, and the downward-facing portions are obscured. The light-from-above assumption isn’t very surprising, since we evolved in a world with an overhead light source – the sun. A less intuitive finding that scientists have made, however, is that light is assumed to originate from the upper left-hand side of space. We know this because, in the lab, people are generally faster to detect convex spheres from a group of concave spheres if the convex sphere is lit from the above-left, and they more readily categorise these left-lit objects as convex. The oddball sphere should pop out from among the others in the top line, but is much more difficult to see in the bottom line (it is the final circle in the sequence). Experiments that measure electrical activity in the brain have also found that left-lit objects are more rapidly recognised than those lit from other orientations. This is demonstrated in the second image. Both the upper and lower rows of circles contain one that is different from the others – an oddball. The oddball in the top row is lit from the above-left and it should “pop out” from the others, which have an exactly opposite shading pattern. The circles in the lower line also have an opposite shading pattern, but the oddball is much harder to detect because its shading pattern does not conform to our above-left expectations. However, like the overhead light source assumption, the leftward light source bias exists outside conscious awareness. And not everyone experiences it. For example, people who read from right-to-left (such as Arabic or Hebrew readers) sometimes show rightward biases or smaller left biases than people who read left-to-right. Interestingly, people who have recently suffered a stroke in the right-hemisphere parietal lobe typically demonstrate a rightward light source bias too. This could indicate that the right parietal lobe – which is responsible for perceiving the physical environment and integrating information from the senses, such as sight and hearing – is ordinarily responsible for orienting visual attention to the left side of space, because disrupting the normal function of that region shifts attention rightward. 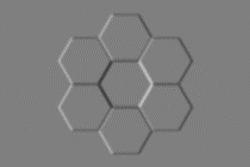 The fact that a person’s culture or brain changes can result in subjective differences in perception means that some people will perceive concavity in certain images, The honeycomb stimulus: some people perceive the central hexagon as convex, others as concave.whereas others will perceive convexity. The honeycomb image to the right is one example that we use experimentally to find out how someone perceives depth from shading. Some people will perceive the central hexagon as convex, while others (usually those with a left bias) as concave. We all assume everyone perceives the world as we do, even if their impressions might be different from ours. It is difficult to imagine that some people might perceive three-dimensional depth differently from ourselves. But if our perception of something as basic as whether an object is convex or concave is not reliably the same across people and populations, how can we begin to judge the subjective experience? Biases in visual perception might explain some differences in aesthetic judgements, but if we can explain why different people have an opposite perception of the same thing, it could, ultimately, further our understanding of human cognition on a wider scale.